If you are caring for an elderly loved one who is part of the LGBT community, there may be a few additional considerations regarding his or her in-home care. Here are some tips to help ensure your loved one receives the high-quality care he or she needs and deserves. In a perfect world, everyone would be accepted for who they are. Unfortunately, this is not always the case, and some caregivers do not provide LGBT seniors with the respect and care they deserve. Before you hire someone to help with your loved one’s care, make sure the caregiver is not prejudiced against individuals from the LGBT community. While having a caregiver is a necessity for some seniors as they age or become ill, a person with this prejudice will likely not provide your loved one with adequate care. It is a good idea to give your loved one the opportunity to be a part of the search for his or her caregiver. Staying shut off inside the home can lead to isolation, which can cause depression, stress, and anxiety, leading to serious medical issues such as heart attacks, strokes, and panic disorders. Seniors in the LGBT community may be fearful of what others think about transitioning to the gender they were not assigned at birth, or even about coming out as gay or lesbian. This can cause your loved one to give into his or her fears and become isolated. Instead, encourage him or her to continue living life by socializing with friends and family. Suggest he or she join groups or organizations for seniors who are a part of the LGBT community. Make sure your loved one receives adequate medical and nonmedical care. The amount of adversity LGBT seniors face may jeopardize your loved one’s willingness to get the Harrisburg at-home care he or she needs. Help your loved one face these challenges by attending medical appointments with him or her or visiting the local pharmacy or grocery store together. Being present can help prevent your loved one from being discriminated against when he or she has a doctor’s visit, gets prescriptions filled, and picks up meals. Many transgender seniors have not gone through reassignment surgery. This can make them feel uncomfortable if they need to undress in front of family, friends, Harrisburg in-home caregivers, or doctors. Make sure your loved one is comfortable regardless of where he or she is. Do not make your loved one feel ashamed or embarrassed about his or her sexuality. Help build your loved one’s confidence and treat him or her with respect and dignity. The more comfortable your loved one is at home, the better quality of life he or she will have. 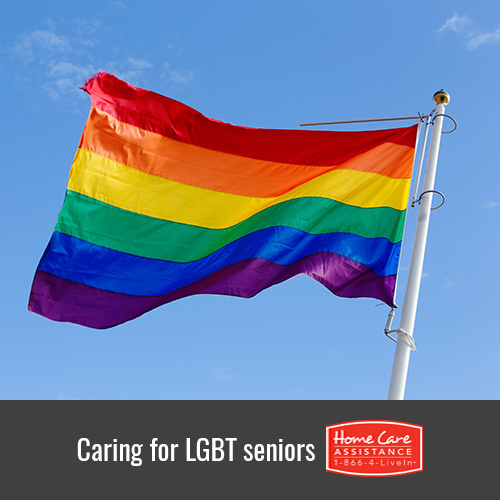 Though aging brings challenges for all seniors, those in the LGBT community may need additional assistance. If you’re concerned about securing care for your loved one that will keep him or her happy, healthy, and comfortable, turn to Home Care Assistance. Our caregivers are trained in the Balanced Care Method, an evidence-based program that focuses on social ties, calmness and purpose, and various other factors that promote senior longevity. We also offer comprehensive Parkinson’s, stroke, and Alzheimer’s home care Harrisburg families trust. For more information and to schedule a free consultation, call (717) 540-4663 today.